During its initial phase, the course will provide an understanding of the African roots of the Bantú religious tradition, known among Afro-Cubans and the Cuban Diaspora as Palo Monte. It will begin by examining Bantú cosmology and religiosity. By gaining an understanding of the Bantús’ view of the Universe and their place in it, the student can develop a deeper understanding of Palo as practiced by the Bantú and their descendants in Cuba. Then the course will turn its focus to Cuba and the historical development of Palo and the hurdles encountered on the island during the era of slavery and thereafter. Additionally, we will discuss the religion’s relationship with the other African religions that prevail in Cuba, as well as its interaction with the variants of Kardecian spiritism. Thereafter, the class will analyze and discuss the more practical aspects of the religion and its applications to relieve human problems through the agency of the nkisis so as to overcome and/or alleviate the many ills that stress humankind. The first half of course is open to anyone that may have interest in learning more about the Bantú-speaking people and their Diaspora. It will be of great relevance and importance for those that are interested in pursuing initiation or greater familiarity with Palo. Because of the private, ritual nature of the discussion, the second half of the course will be exclusively for the initiated. For those that do not live in South Florida, the class may be accessed through Google+. We stress that Google+access and seating are both limited, so reserve rapidly. Q. How often will the class meet? Monthly? Weekly? A. Class is scheduled to meet every Thursday night excluding Holidays. Q. I am an initiate and I want to learn more about Palo but I understand that to do so I must be an “apprentice.” Does your class replace this? A. There is still very little information available to the public in regards to Palo and even less to those that don’t speak Spanish. This is why I created my class. We are in a new era. In the past most initiates were raised around the tradition and were at the very least familiar with the music. That’s not to say that the previous generations didn’t have their issues. For instance; initiates have become less and less aware of the origins of Palo. Today we are faced with new challenges but we have also been given new tools with which to overcome those challenges. I intend to use those tools to try to preserve Palo traditions and history. One cannot “learn Palo” without initiations and an elder to guide them. But for those who are initiates abundant examples of different techniques used among different Palo traditions will be given in order to gain a deeper understanding of practice. Q. Is your “for initiates only” portion of the class only for new initiates or those with little practice? A. Absolutely NOT. We are open to students of all levels of experience. While most experienced practitioners can answer that Palo is “Congo” in stark contrast to their Lucumi counterparts they can’t expound on what “Congo” means. Also many will be ignorant to the practices of other denominations within Palo. This class will provide an opportunity for both. Q. What will the class actually cover? Does it differ from the previous seminar that was given two years ago? A. This class is not the same seminar that was given in the past. That seminar concentrated heavily on the history of the bantu speaking people and possible antecedents of Palo practice in Cuba. This seminar will revolve more around what “Palo” is, how it developed in Cuba, how it was affected as well as how it affected other cultures and traditions it encountered on the island as well as why it was maligned. We will also discuss the role of the different spirits in Palo including the kimpungulu, nkita, basimbi, nfumbe, and kinyula nfuiri ntoto. While not identical this would be akin to learning about the Orisha pantheon, egun and iwin. We cover the definition of nkisi, often described by Anthropologists as “fetishes” and touch on the role of divination, music and initiation. Finally we will learn about the “munanso” (temple house similar to an ile), the different ranks of initiation and “plazas” or “positions” within the house. This part is open to anyone and everyone who would like to attend. The second part however is open to initiates only. 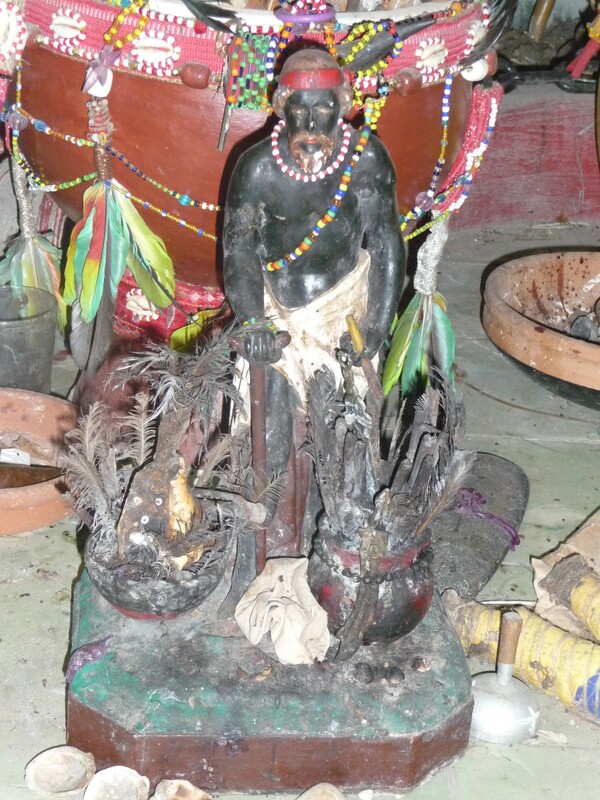 Here will cover the use of different nkandi (plants) and nkunia (sticks) for spiritual and medicinal purposes. We will learn bozal phrases, Congo (as defined in Cuba during the 19th century) vocabulary, chants and liturgical music as well as delve into the importance of animals, the position of the moon and the sun and the use of patimpembas (firmas) their use and meaning.